As significant transformations to campus health sciences spaces get underway, the Health Sciences Library is taking a look at its own spaces and services, looking for ways to best meet our customers’ needs in this changing landscape. To that end, we are reaching out to the populations that we serve, inviting students, faculty, and staff in the health sciences, to participate in informal focus group sessions throughout the month of November. Sessions are planned as follows. We’d like to learn more about your workflows, barriers to your success, and how library spaces play or could play a role in overcoming those barriers. Help us improve library spaces and services by registering for one of our three group sessions. All sessions will be held in Prior Hall room 200. Refreshments will be provided. Space is limited to 10 participants per session and RSVP is required. Register at https://osu.az1.qualtrics.com/jfe/form/SV_3qFUD0rLpazxFPf. If you’d like to provide comments on the topic of library space but are not able to participate in a focus group, please use the registration form and follow the prompts for not being able to attend. Any questions may be directed to Stephanie Schulte, Stephanie.schulte@osumc.edu, Head, Research and Education Services, Health Sciences Library. Would you like to comment on librarian assistance? 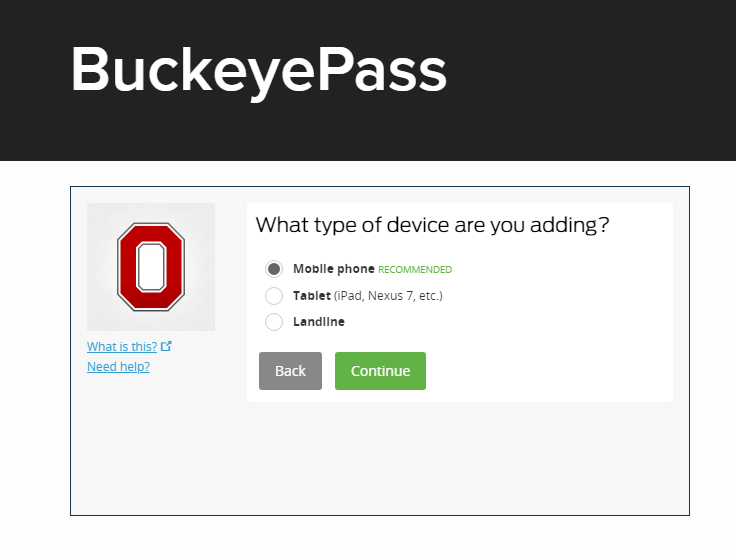 Use our quick survey: http://go.osu.edu/HSL_LibrarianImpact. If you think you’ll never NOT have your phone with you when you need it . . .
Download 10 passcodes to use when you need them. 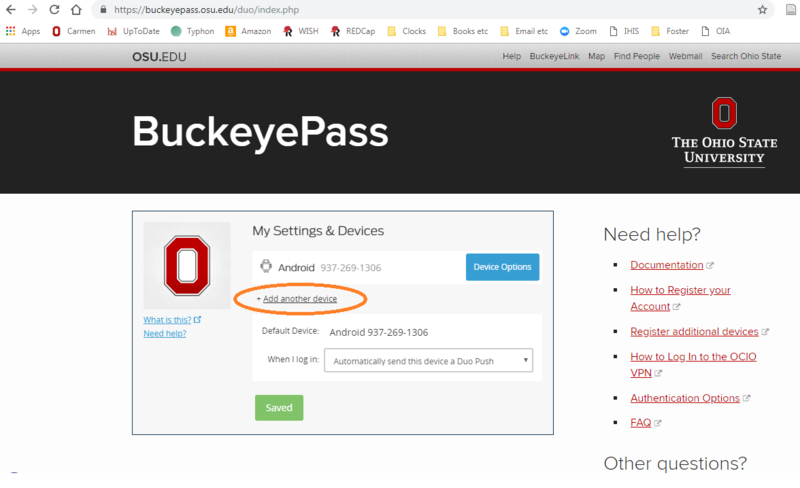 Go to buckeyepass.osu.edu, click on “Register/Manage Devices,” and read the instructions under “Register additional devices” or “Authentication options” (to get 10 passcodes texted to your phone). If you choose the option to get 10 passcodes, print them and store them with your other valuables like credit cards and driver’s license, or other important things you bring to work. Scammers are getting exceptionally clever lately and have started sending out very scary and convincing emails. These emails usually put a user’s actual password in the subject line to make it more credible, claim that they’ve hacked the recipient’s computer, and threaten to release very personal information to friends and family via social media if the scammer isn’t paid a large amount of money. While this is a very convincing trick, it’s still only a trick. When websites get hacked, attackers often make off with a database of usernames, email addresses, and “hashed” (encrypted) passwords. While the passwords aren’t immediately useful, the hashes are usually posted to the internet where they can be reverse engineered and decrypted. If you were one of the affected users, anyone in the world can get a copy of your email and the password you used for that site. Check https://haveibeenpwned.com. Enter your email address(es) into the field to see if any of your addresses have ever been affected by a breach. If so, you should assume that the password you used for that site is compromised and you should change it on any and all sites that share that password. Use unique passwords for each website. If you use a password manager likechttps://www.lastpass.com/ or https://1password.com/, you can generate unique, secure passwords for every service you use and never have to remember them. If a site you use ever gets breached, attackers will only have your password for that site, instead of every site you use. Change your passwords often, especially if you are informed that a service you use has been breached. More phishing: Avoid taking the bait! Please be especially vigilant for phishing emails. We’ve noticed an increased number of suspicious messages coming to faculty and students that are particularly clever. Messages sent as a “reply to” a message already in the infected user’s inbox, which makes it harder to detect. The body of the message does not contain a greeting, a signature or an explanation for why the user would be sending you a link rather than including the information in the message. Messages may appear similar to this screenshot below. 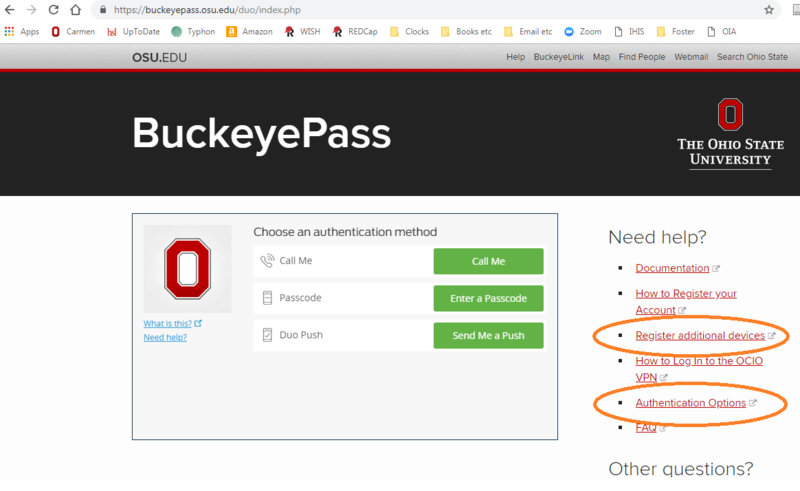 Messages include a link that directs you to an unrecognized, possibly malicious site (usually addresses that end in something other than “osu.edu,” as depicted in the screenshot below). The Office of the Chief Information Officer is working on this issue. 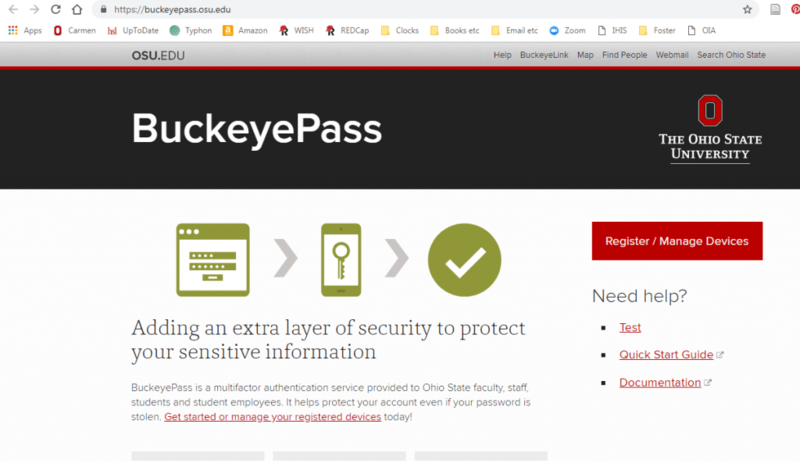 In the meantime, please do click any links in suspicious emails and forward all suspicious emails to report-phish@osu.edu. Proctorio has been available in Carmen for a few months now. This tool allows for online proctoring of exams with settings that can be adjusted for a variety of scenarios (for example, an open book exam or a group exam). John Pryba and Alice Teall gave a Flash Friday presentation about the tool, including how to enable it in a course, set up a quiz to use it, and how to view reports. Watch the recording of the presentation and learn more about Proctorio on the ODEE website. At the beginning of each semester, instructors often wonder if the pages and links they copied from their previous semester’s course transferred in good working order to the new, current-semester copy of their course. There are many reasons a link that worked perfectly last semester might not work this semester, so it is best practice to check your Carmen course links at least once per term. Carmen has a handy link validator that will do this (mostly) automatically for you. In your Carmen course, go to Settings > Validate Links in Content. 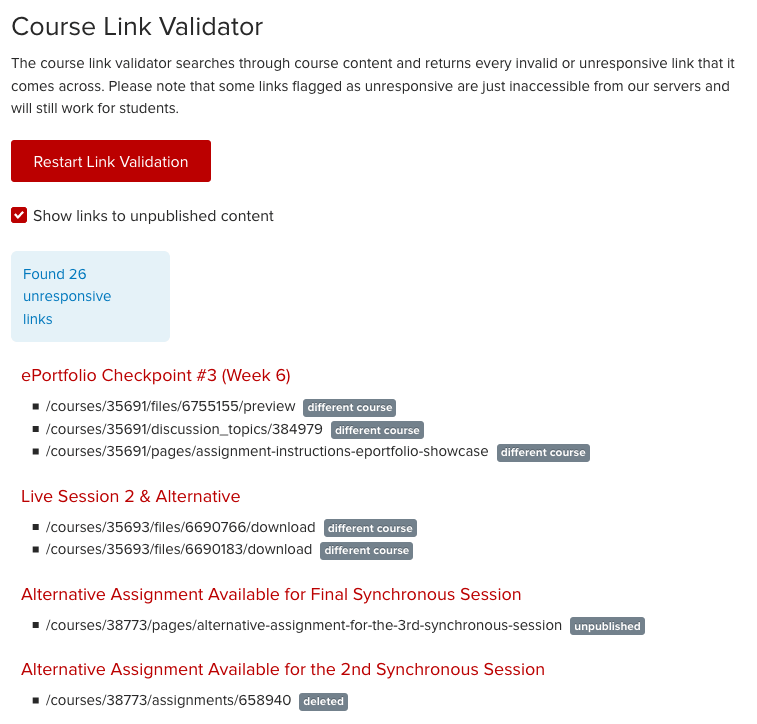 The link validator will cause a process to run that identifies links in your course that may be problematic, and it will even tell you the reason for the problem. If you have questions about using this tool, please let us know in the CON-IT department. Also, check out the additional ways you can double-check your course for errors and usability according to the Canvas community. I am often asked about how one knows whether a multiple choice question is “good” or not. Expertise in the field always makes the final decision, but there are guidelines and statistics that can provide very helpful support in writing and refining multiple choice questions. Nikole Hicks, PhD, RN, CNE, wrote a Fairness of Items tool (FIT) to guide writing and assessment of multiple choice questions. Read more about her development of this tool. I have her permission to share it with OSU College of Nursing faculty, so email me (Joni) to obtain a copy. If you are somewhat familiar with statistics and need a quick guide to quiz item analysis, refer to this PDF from Anne Schoening, PhD, RN CNE. A more detailed explanation of item analysis of quiz questions is presented in this article McGahee and Ball (2009). You can access the full text of the article through the OSU Health Sciences Library. As always, please consult with the your instructional design experts on the CON-IT team if you need additional assistance with question writing and evaluation. We have an exciting new presentation tool available for you and your students to use at OSU: Adobe Spark! As of July 1, you can log in to Adobe Spark Premium with your OSU credentials to create beautiful presentations with video, images, and buttons that take you to web sites. Find out how to get started (it’s easy!) and learn more about using Spark at Adobe.com, or email us at con-it@osu.edu (students please email con-s-help@osu.edu) and we’ll be happy to assist. View additional example presentations from education in the Adobe Spark gallery.